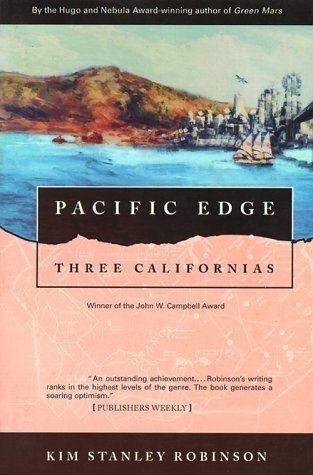 Pacific Edge is part of the Orange County trilogy. It was published in 1990. In a near future California after a revolution in legislature, an ecological utopia has been reached. But greed and grief still exist.It follows the story of Kevin Claiborne, a member of the Green party in the town of El Modena, California, who fights against the conversion of a parcel of wild land into a commercial-industrial complex. The importance of personal relations in local politics and the intricacies of water law are prominent. Many aspects of the life of El Modena can be found in Robinson’s interests (town council meetings, softball) and in his current town of residence, Davis, California. 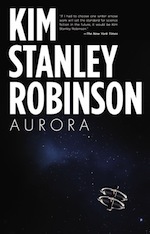 In many ways, Pacific Edge presents Robinson's most accomplished utopia and served as a basis for ideas explored in the Mars trilogy. The novel is composed of 11 chapters, all written in the third person. The majority is written from the point of view of the main character, Kevin; parts are from the point of view of his grandfather Tom (ch. 3, 10). Letters from Oscar, of a different style and content, close some chapters (ch. 3, 5, 9). Starting with ch. 2, each chapter begins with a short passage in the first person, close to a personal diary or a stream of thoughts, from an unnamed narrator that we come to identify as a younger Tom, before he started actively fighting for legislative change. Special mention must be made to ch. 6, which takes place in a single evening, with long descriptions of a communal experience and of the wilderness. The novel takes place in 2065 (approximately from winter-spring to October). After a difficult legal struggle in the 2020s-2040s, the United States have reached a way of life comparable to an ecotopia. Company sizes are limited; land, water and energy are nationalized; and green ideas are respected and taken seriously. People do town work, like tearing out the asphalt roads from the wasteful past; they live in common houses; they take shifts in taking care of the neighborhood kids; citizens can be active in the town council; and softball is a very popular game. In the small town of El Modena, California, in 2065, Kevin Claiborne is a 32 year old man that works in building renovation and construction with Hank and Gabriela – work that makes buildings energy-efficient, green and beautiful, thus more livable. He learns that Ramona Sanchez just broke up with Alfredo Blair after a long relationship; Kevin knows he’s in love with Ramona. He just got a place in the town council as a member of the Green party, along with Doris Nakayama (with whom he has had a relationship). The party opposing him is the New Federalists, of which Alfredo became the new town mayor; Oscar Baldarramma is the new town attorney. In his first town council meeting, Kevin notices an item concerning the purchase of large quantities of water from Los Angeles’ Metropolitan Water District with a lower rate, thus making savings for the town. Kevin disapproves this proposal from Alfredo, sensing there’s more to it. The Green policy is that little water means growth control: offering more than what is needed is bad. The New Federalists say that job generation and business development can be beneficial to all: pushing the negative growth of the last decades too far can become dangerous. Acquainting with the peculiar huge and intellectual Oscar, Kevin and Doris learn that Heartech, Alfredo’s firm, might have plans for a new complex on Rattlesnake Hill, the only hill of El Modena that is still kept in the wilderness. Doris’ friend Nadezhda Katayev is an aged Russian-Indian teacher that’s visiting El Modena, her ship being docked in Newport. Nadezhda actually had met Tom Barnard, Kevin’s grandfather, when they were both younger, when they were changing international law and the world in the famous Singapore conferences in the 2020s-2030s. Tom now lives as a recluse, remembering his dead wife and his achievements as a lawyer far away. But the energetic Nadezhda and the pleas of Kevin needing help with the Rattlesnake Hill developments draws him out to the open again. As Kevin and Ramona draw closer, often going to fly with a glider, things between Kevin and Alfredo get tense. Then Doris discovers a rezoning proposal for Rattlesnake Hill from open space to commercial in the town planner’s files. Oscar takes Kevin and Doris to Bishop, where they meet Sally Tallhawk, specialist in the murky law of water; they hike and they camp as Sally explains El Modena has more than enough water and gives them hints of actions they could take. In Bishop, Kevin and Doris are surprised to discover Oscar and Sally are professional wrestlers and they watch a match between them. After getting drunk and a bar fight, Kevin and Doris end up together for the night. Kevin, Hank and Gabriela start doing heavy renovation work on Oscar’s house. Kevin, supported by the Green party, tries to bring the non-partisan town council members to their side. Doris quits her job as she discovers her firm is joining Heartech in the Rattlesnake Hill complex project – but not before making a copy of all the firm’s documents! The night of the first manned landing on Mars, all the friends spend a surreal night in hot water ponds among the woods, with animal masks, shamanic incantations and tequila. Tom and Nadezhda are happy together; Kevin and Ramona finally confirm their relationship; Doris is jealous of Kevin and Oscar, believing he has a chance with Doris, follows her and ends up spending a night alone lost in the woods. Tom’s investigation reveals that Heartech might have an illegal source of capital from Hong Kong. Oscar finds out that municipalities in fact cannot resell water, this is a business allowed only by the state; so Alfredo’s plans to have the water pumped back into the underground basin, thus saving money for El Modena, are impossible. The town council ends up voting down the buying of the water! Kevin and Ramona have a great time, until Alfredo comes back to talk with her. Ramona, confused and uncertain what to do, takes some time off El Modena. Later, Kevin is numbed to learn that Alfredo went to find her and this visit won Alfredo his relationship back. Tom further investigates as both parties go on a public campaign for and against the Rattlesnake Hill complex development. Oscar takes Doris to a drag cars race (cars using alcohol). As Tom discovers connections between Heartech and the American Association for Medical Technology, a conglomerate rebuilding the medical industry power base, a brushfire spreads and burns Tom’s house; Kevin and Hank find inconclusive evidence of arson. Tom explains that from the beginning Alfredo and Heartech got involved with the black operations of AAMT with illegal loans to get Heartech going; eventually dealings became a mix of saving lives and making money; Alfredo couldn’t bargain against AAMT – but Tom has no tangible proof. Tom ends up leaving with Nadezhda on her ship. Kevin and Doris keep campaigning. The Green party stops approving the fight: if the Green let go of Rattlesnake Hill, Alfredo shall make concessions elsewhere. Kevin and Alfredo discuss Ramona and Rattlesnake Hill and still can’t come to a compromise. On a tropical storm, Tom drowns; everyone is dismayed. Work on Oscar’s house is finished. A public vote in El Modena approves of the Rattlesnake Hill development. The Hill is rezoned from open space to commercial. Then Kevin has an idea so symbolic that it changes everything: he holds a memorial service and puts a commemorative plaque for Tom on a sycamore tree on Rattlesnake Hill. Later that year, Ramona and Alfredo get married. Kevin realizes he wanted Doris, but he now sees that she is with Oscar. Kevin bikes away madly, feeling the unhappiest man alive. Then he laughed at this very thought. At 32, he was recently appointed as a town council member for the Green party in El Modena, California. He is shy and works in building renovation and construction. He is Kevin’s grandfather. He did law and politics and was very active in the legal reforms of the 2020s and 2030s. Now at 81, he lives like a recluse until Nadezhda draws him out once again. From Chicago and Bishop, he is the new town attorney. He is around 40 and has an imposing physical appearance. He is cultured and has a critical view of the simple rural life in El Modena. Now a teacher of population biology, she is strong and very beautiful. She had a longtime relationship with Alfredo, then a short relationship with Kevin before ending up with Alfredo. After 6 years in the town council for the New Federalists, he was recently appointed as the new mayor. He is handsome and has a moustache. He created and runs the medical technology firm Heartech. Originally from Russia but a longtime dweller of India, she was part of the legal struggle of the 2030s, headed the Soviet State Planning Commission and worked in a superconductor institute. Now she teaches history in a school freighter. Housemate and friend with Kevin, she has been in the town council for the Green party for 2 terms. She is passionate and works as a materials scientist. At 22, she is tough, wild and has a mouth. She works with Kevin in construction. At 42, he tries to go by the rule "moderation in all things, including moderation". He works with Kevin in construction and he's a Minister in many churches. Note: Page numbers refer to the 1995 Orb paperback.